The Floating Library is closed for the season. Stay tuned here for an announcement of the where and when of the next appearance. In the meantime, take a look at all the places we’ve been here. 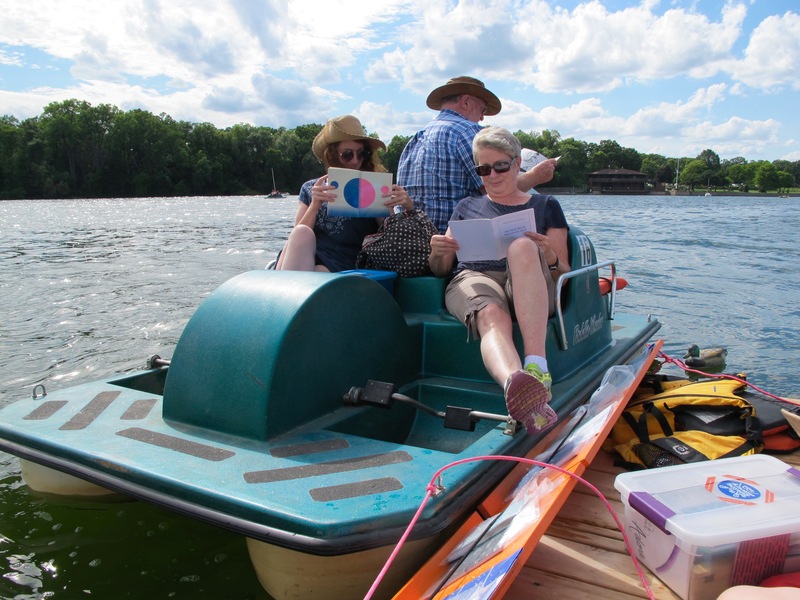 In summer 2018 the Floating Library returns to Lake Phalen on the east side of St. Paul, MN. We acknowledge that this body of water, as with all waters and lands in the place we call St. Paul / Minneapolis / Minnesota, are Dakota and Anishinaabe homelands. We invite you to join us in honoring this past and present as you spend time at the Floating Library. Find us anchored off shore near Phalen Park Beach for three weekends mid-July through early August, weather depending. NEW THIS YEAR: Join Floating Artist-in-Residence Anh-Hoa Thi Nguyen and learn how to fold a simple paper boat to contribute to Waves Enfolding, a paper memorial to lives lost in the refugee waves from Vietnam. A selection of Floating Library books will also be available to read on the beach. Also join us for a closing reading and ritual on Sunday, August 5 at 4 pm on Lake Phalen Beach. Canoe, kayak and paddle boat rental is available at Phalen Park Beach through Saint Paul Parks and Recreation during Library open hours. For rates and further info, go here. Other rental options: If you plan ahead, the University of Minnesota’s Recreation Department has inexpensive weekend-long canoe rentals if you pick up your canoe on a Friday. Note: they are closed on weekends. Please note that the Floating Library is designed for access by canoe, kayak, paddle board, rowboat or other small watercraft. Swimming to the Library is possible but not recommended. Swimmers are not allowed to climb onto the Library raft. Check the weather before you head out! To protect the books and the Floating Librarians, the Library may open late or close early if the weather is dicey. Altered hours will be posted on the FL’s Facebook, Instagram, and Twitter. I’m looking forward to the closing event! Will there by anything that is visible/audible from the shore? Yes, we’re going to structure the event so people can listen from shore. The raft will be “docked” off the tip of the picnic island. When you get to Silverwood just make your way out to the island past the picnic tables. There will be people there to help guide you.